It's my twenty-fifth birthday today. Just wanted to share a little blast from the past with you all. 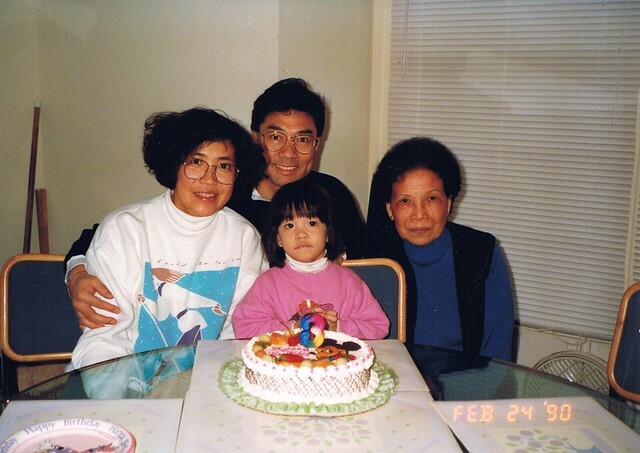 Mom, Baba (my dad), and 婆婆 (my grandma) at our old house in Jersey celebrating my third birthday, 1990. Twenty-two birthday cakes later, I've come along way to present day -- no longer shy and scared of my own shadow. And yes, that is indeed Mickey Mouse iced onto the top of the cake. Anyways, I'm hoping not to be counting beans today (still up in the air, unfortunately), but rather just spending the day relaxing with Marcus and Neutrino, our kitten (more like cat these days :P). The ideal plan is to grab brunch at Trestle followed an afternoon of attending a Serious Eats cookbook signing with Ed Levine, its founder, and Carey Jones, its editor, at Williams-Sonoma Columbus Circle and making our usual "birthday stop" at Argo Tea. Those are the best birthdays -- the ones where you spend it with the ones you love over an afternoon of relaxing and loosely laid plans.